I am truly hoping that you ALL have wonderful, New Years! 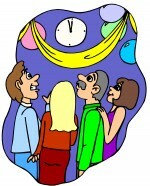 I hope that you and all the cozy mystery readers who visit your site have a happy, peaceful and successful 2011. Here’s hoping for a healthy and happy 2011 for you and yours. I hope to enjoy your site in 2011 and many years to come. I just know it’s going to be a happy, healthy, and great year for all of us! I just added your site to my “favorites”. Do you know anything about the release of Sue Henry’s latest book “Cold as Ice” and why it has not been released for publication yet. I do hope Sue is well and was able to finish the book. Hi June, and welcome to the Cozy Mystery site! As for Sue Henry’s latest book (Cold as Ice) I have no idea what happened to it. I just checked on Amazon and they are doing the same thing with it – as they did with Lilian Jackson Braun’s last book… which, incidentally, I don’t think is going to be published any time soon.